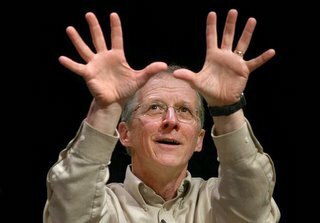 I've recently discovered that John Piper's latest book is out - the 4th in a series of biographical sketches on great fathers of the church. I also recently got to hear Piper speak on one of the men highlighted in this book - Athanasius. Never heard of him? I vaguely recognized his name - probably from my church history class with Dr. Mitchell - but was soon reminded of his great contribution to a crucial doctrine we as evangelicals hold so dear. It was - I'm guessing - around the turn of the 4th century when Athanasius was up against a guy named Arian, who denied the very deity of Christ (therefore denying the Trinity). The acceptance of this doctrine came to a head at the Council of Nicea in A.D. 325 as it boiled down to one iota, literally. While some of the Nicean council members were satisfied using the word homoiousis (homoi meaning “similar", and ousis meaning "nature”) to describe Christ's relationship to God, Athanasius argued that this wasn’t good enough. He wanted to use the word homoousis, meaning “same nature” to describe Christ. Thanks be to God, he ultimately won the council over so that to this day the word “homoousis” is used to describe the identical nature of Christ and God. There's some great material here on this topic. Hopefully you see the importance of this. Was Christ truly God or not? And upon what did this debate hinge? ONE LETTER!! So Piper, in the message I heard him deliver (I don't know if he makes this plea in the book, because I don't have it...come to think of it, I don't have any of the Swans Series books. ), challenged us to fight for truth...to fight for theology...to fight for "the iota"...if it involves crucial matters of doctrine. But as for you, teach what accords with sound doctrine. Older men are to be sober-minded, dignified, self-controlled, sound in faith, in love, and in steadfastness. Older women likewise are to be reverent in behavior, not slanderers or slaves to much wine. They are to teach what is good..."
by Crossway Bibles, a division of Good News Publishers. Contending for Our All, the fourth book of John Piper’s The Swans Are Not Silent series, examines the lives of three giants in the history of the church – Athanasius, John Owen, and J. Gresham Machen. Their battles in defense of the truth have paved the way for a deeper understanding of the character of God, the person and work of Jesus, and God’s promises contained in Scripture. 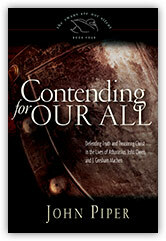 To order call Desiring God at 1.888.346.4700 or order online today.